Have you got closet Claustrophobia? Do you hate going into your closet? Do have a closet full of nothing to wear? Every morning, are you in a frazzled rush trying to put on any clothes you can find? Are you buying duplicate linens and towels because you cannot get in your linen closet to see what you have? And is that office supply closet full of more merchandise than Office Max or Staples? These are all signs that your beloved closet is in total disarray. Rest assured, it does not have to be that way. Captured Clutter… organizing therapy, LLC has the therapeutic cure for those closet blues. 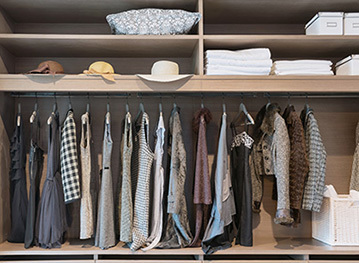 Let us help you manage your wardrobe with proven strategies to find a space and place for all your essential items. Start your day stress-free as you find what you want to wear from your well-maintained, organized wardrobe. Your refined closet system will allow you to make better shopping decisions and save money by not buying duplicate items. We start with a discussion of what you would like to see and what you are currently seeing. Then we put a plan into action. While our services do include a post-session follow-up to make sure you still have the hang of it, you will ultimately be responsible for maintaining the system once we set it up. So what are you waiting for? 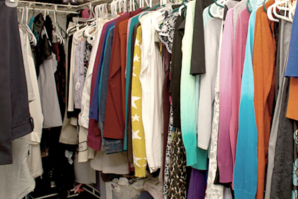 Are you ready to tackle your closet hang ups? Can you resist buying one more legal pad? Wouldn’t you rather spend that money on a luxury liner instead of buying yet another set of luxury linens (that you probably do not need)? Call (678) 294-7813 today to find out how you can cure your closet blues. Need Assistance Organizing Your Closets? Linda created a Move In Move Out checklist and notebook which we followed religiously. She also introduced a team of specialists that helped me with such items as digitizing photos, home improvements and ultimately finding the right agent that could sell my house quickly.